No-Boil Chicken Penne - cooked chicken, pasta sauce, ricotta, basil, mozzarella and parmesan cheese. 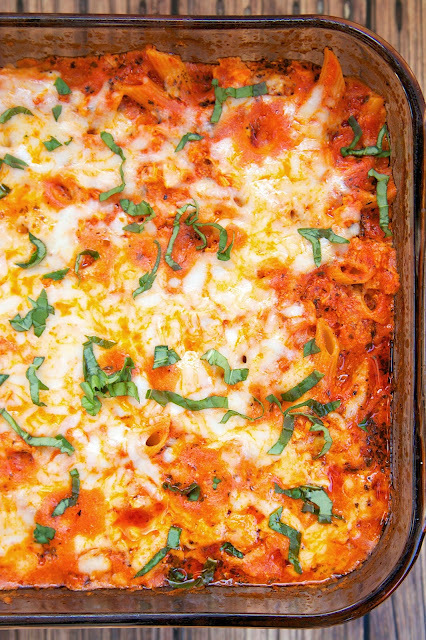 Everything bakes in the oven, even the pasta! This makes a lot. We ate it for dinner and lunch the next day. It was equally delicious reheated. Serve with with some crusty garlic bread and a salad for an easy weeknight meal! The whole family gobbled this up! 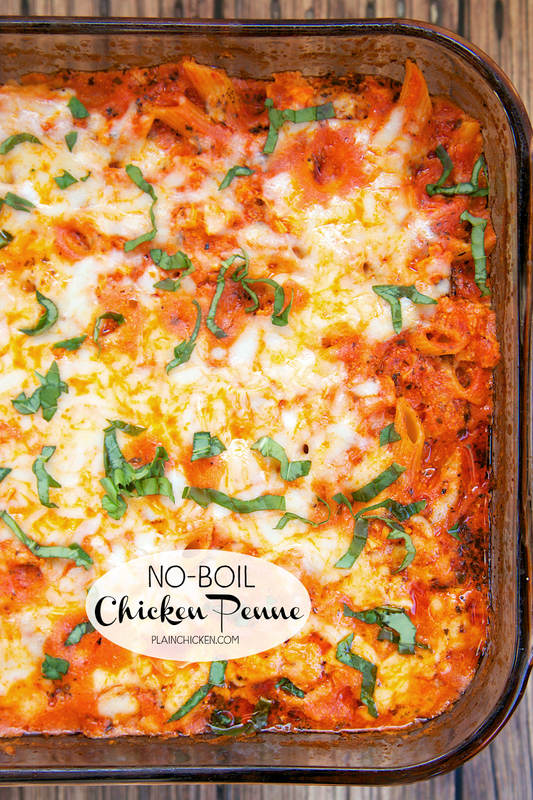 No-Boil pasta casseroles are one of my favorite weeknight meals! It only takes a minute to assemble and the oven does all the work! 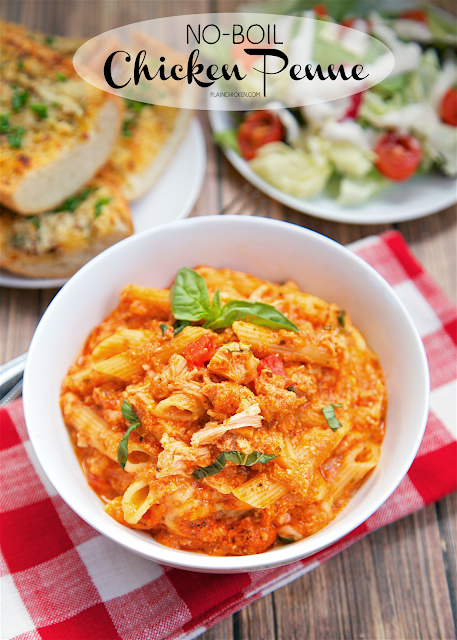 This No-Boil Chicken Penne is one of our new favorites! Chicken, pasta sauce, ricotta, basil, mozzarella and parmesan cheese. What's not to like?!?!?! I used half of a rotisserie chicken in this recipe. I always have some rotisserie chicken in the freezer for casseroles. I used a jar of Trader Joe's Roasted Garlic Marinara sauce. It is my absolute favorite jarred pasta sauce. I use it in all my pasta casseroles! This makes a lot. We ate it for dinner and lunch the next day. It was equally delicious reheated. Serve with with some crusty garlic bread and a salad for an easy weeknight meal! Preheat oven to 400ºF. Lightly grease 9x13 pan; set aside. Combine sauce, water, ricotta 1 cup of mozzarella, cooked chicken, parmesan and penne. Pour into 9x13 pan and cover with foil. Remove foil and top with remaining mozzarella cheese. Bake for 5 to 10 minutes, until bubbly. Remove from oven and sprinkle with chopped basil. No Boil? Sign me up! This looks like the perfect weeknight dinner! Sounds great! 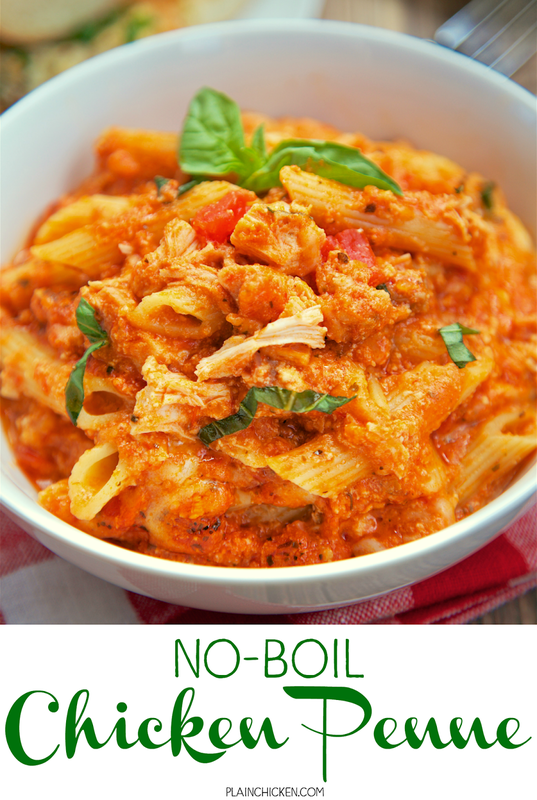 Do you regular pasta or the no boil kind? I take lunch next week to ladies who are in job training classes. This with a big salad would be perfect. There are 10 ladies so do you think this would be enough or should I double it? I did use regular pasta in this. If you double it, it will definitely feed 10. Enjoy! One more quick question, I have a ton of venison hamburger meat and maybe even some venison italian sausage. Have you ever tried this with anything other than chicken. I'm am imagining a lot of possibilities! Thanks bunches! Instead of doubling, I may make 2 versions - chicken & venison.